mmm mmm... finger lickin good! 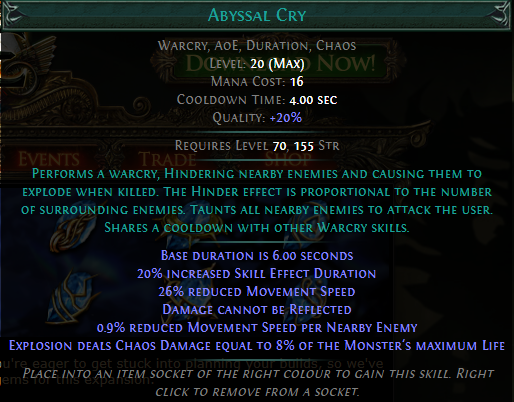 Herald of Agony Juggernaut capable of tackling all game content with relative ease. What you see above is my Standard toon "Ceresee". Using him as a testbed I've taken a lot of time to iron out all the details in this build. 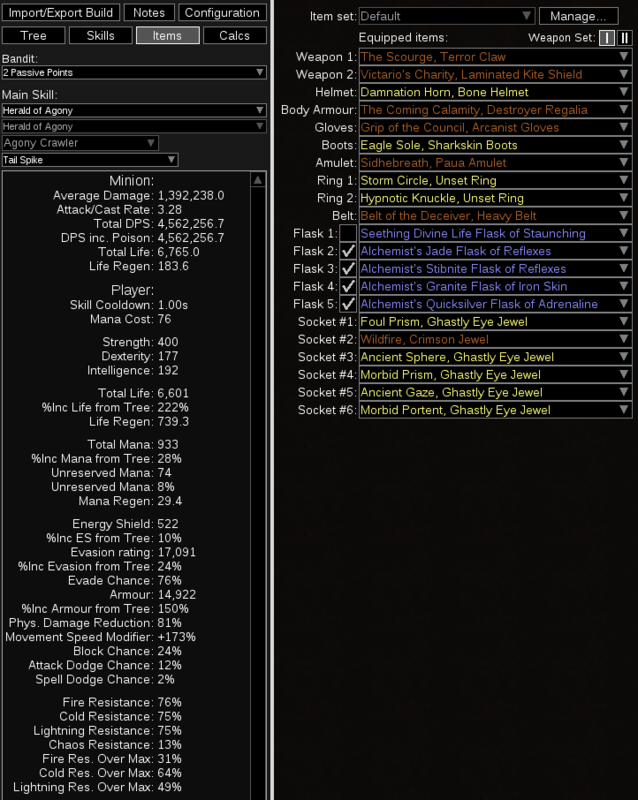 There are many moving parts to get max potential DPS to ~4M+. Keep in mind it's not sustained DPS, but I've taken the time to maximize uptime of every temporary effect. Also remember, that no build needs this much DPS. 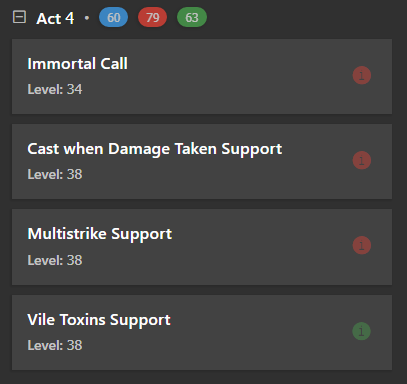 The PoB Config section is setup as shown to let you understand what are all the effects that are being taken advantage of. Not taking advantage of temporary effects is neglecting a key mechanic of the game. Just because something doesn't have 100% uptime, doesn't mean it isn't worth investing into. Specially when all it takes is adding it to a lvl 2 CWDT setup. Inevitably some effects will have better uptime than others. For example, granting Frenzy charges to Minion is pretty reliable, as all it requires is hitting, which is something we do a lot of to maintain Virulence. Granting Power charges, on the other hand, will rarely happen, as we don't get that many kill blows. **IMPORTANT** In order to enable Point Blank calculation for Herald of Agony, you must first set "Projectile travel distance: 1" for Molten Strike Magma Balls. Herald of Agony will not show the "Projectile travel" option under Calcs. 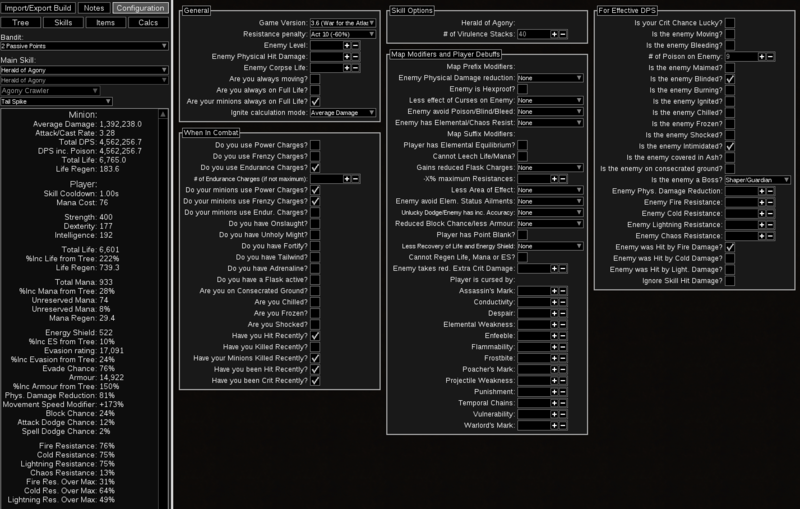 *Numbers in PoB export may differ from screenshots as I am still making small tweaks. Remember only Deceiver belt will give you Intimidate, so swap to it for tanky bosses. If you go with Gluttony, then swap Granite to Jade flask. The helmets took me a few tries with fossils to craft. Really not that hard as there aren't many cold/chaos/minion options to roll. The BloodGrip is for Uber Lab bleed traps. There's not much to it, as you're not doing much damage yourself. Your job is to whirl around and cast Molten Strike on mobs to poison them and gain/keep your Virulence stacks at 40. For the most part you can stand still as you gain Fortify from Molten Strike itself, but you know, move around. Don't focus too much on what the crawler is doing or waiting for it. It rarely leaves things alive, so just keep moving forward. When it gets stuck or you Flame Dash across a chasm, use Convocation to port the Crawler to you. Similar thing for Proximity Shield mobs; go into melee range and Convocate. Your flasks should be full pretty much all the time, so you can somewhat spam them. Full charge for tough bosses. No regen maps are cancer as we have a small mana pool. 90% to avoid ailments is pretty annoying too, but doable, even in T16. Reflect maps are NP, but use best judgement always. When in Single Target configuration and attacking something like Shaper, or Minotaur, remember to use Convocation to keep your Crawler at Point Blank range of the boss for the bonus dmg. I did Uber Elder with Pierce, so DPS can be much higher if you are good at managing your Convocation and running Point Blank. As you can see in the videos DPS is more than enough with Pierce. The Minion Crawler doesn't take damage at all, so it's always Full Life. I leave it up to you to figure out how to level, but you can just use Molten Strike itself. Either way, there are innumerable resources to learn how to level. I recommend Engineering Eternity's YouTube channel. 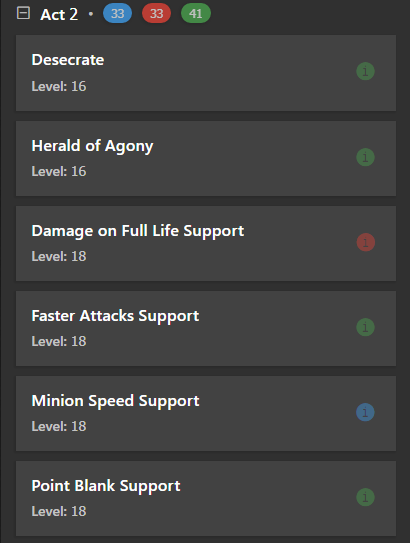 This build should be pretty good for HC. It's more than tanky enough. To make it even tankier grab a Stone Golem, a Decoy Totem, Enfeeble/Temporal CWDT, a Stibnite Flask, +blind Jewels and +life regen Uber Lab enchant on boots. The tree is also pathing close by to 3 more Endurance Charges you can pick up. The one stat we're starved on is Dexterity, so any ring with high Dex + Elem. Res. + Life is what you want. Make sure you NEVER use anything with +Cold DMG, as that will break your Elemental Equilibrium. You can use +Fire, +Lightning, though +DMG does nothing at all, as it will not apply to your Minion. Remember you aren't doing much damage yourself, you just want some fire dmg to proc Elemental Equilibrium, something "Molten" Strike already does on its own. 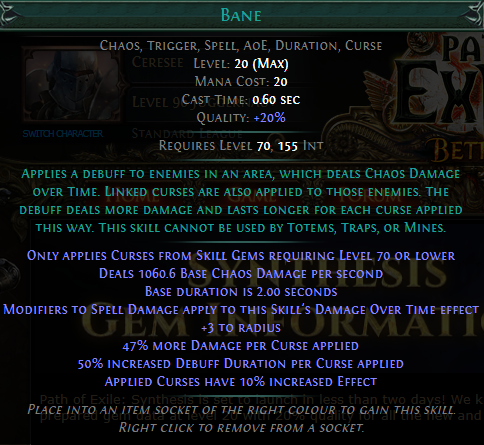 Hi, nice guide, but can I use cyclone as alternation for molten strike because my PC cannot handle MS? If I can what gem link should I use? Yeah, you should be able to use Cyclone and probably some other skills. 1) Hit with some Fire or Lightning dmg so you proc Elemental Equilibrium for the Cold dmg your Minion is doing. 2) Have a good chance to apply Poison to stack Virulence quickly. 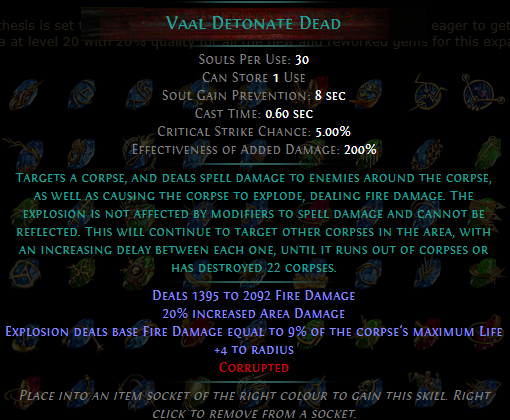 I'll look into doing some testing with other skills to proc virulence/EE. 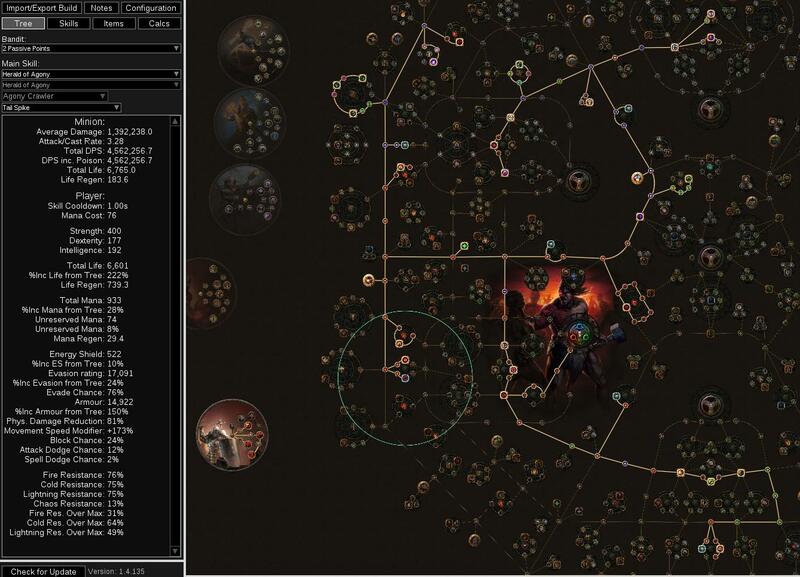 I did a bit more testing with ways to meet the need to proc Elemental Equilibrium and fast Virulence/Poison stacking. Static Strike: Does proc EE, but Poison/Virulence is no good on single target. Viper Strike: Does Poison/Virulence, but requires +added lightning to proc Elemental Equilibrium. Not amazing but at least usable. Cyclone: Works pretty well linked with +added lightning, +poison, +faster attacks. The only issue is without optimizing for attack speed, it feels clunky and gets stuck in attack. Also, the low mana pool makes it tricky to use, as you have to make sure to hit something on first cast. Hopefully this may not be a problem soon, depending on how rare the new HoA ring is. 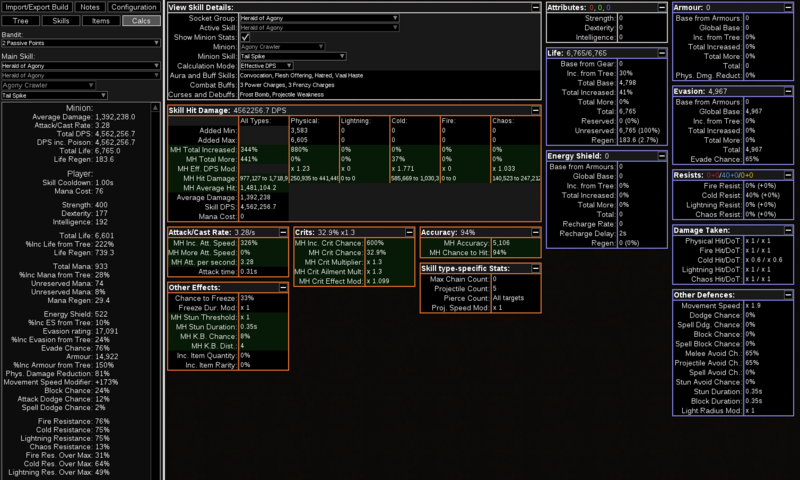 The strength of Molten Strike is in it being able to hit the same target with multiple projectiles while taking care of both EE proc and fast Virulence Stacks. 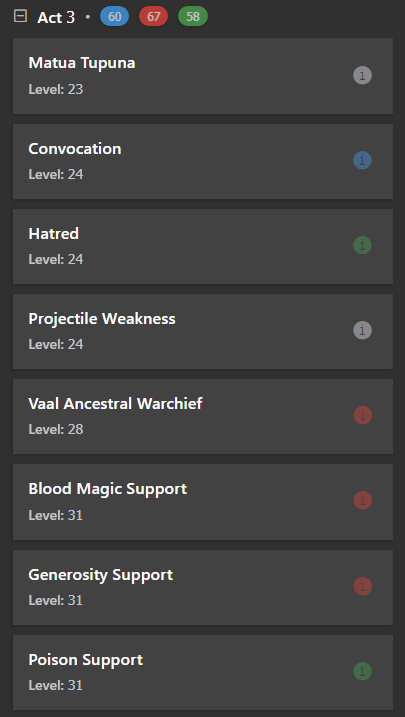 Any possibility of posting a pathing guide or what to go for first on the skilltree? Prios etc. Skills branch off from each other everywhere but all are good/necessary. Actually, 3.6 will be my first time lvling it too. You can go for all the life and be ridiculous tanky, or you can go for all DPS. It really depends on how experienced as a player you are. Personally I go for DPS following PoB "sort items by DPS" looking for cheap ones that give me good boosts and in the tree page "Show Node Power". 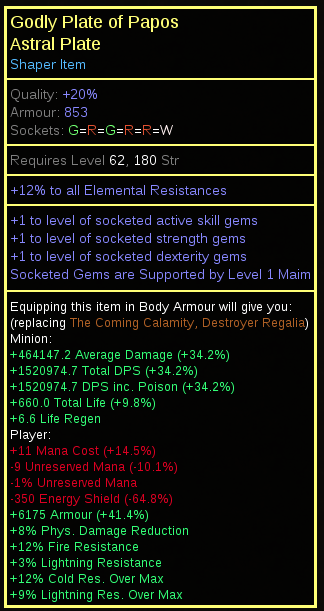 For gear, just whatever drops. 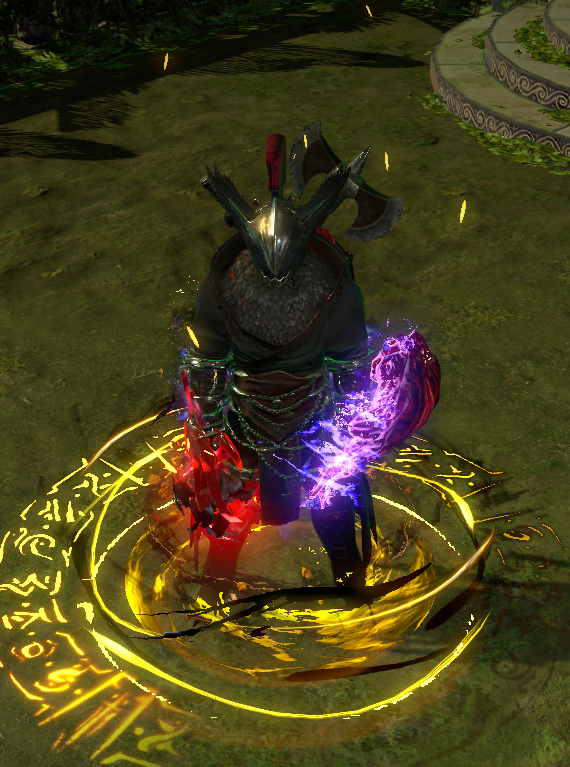 Just get a Shadow, Ranger, Duelist or Scion to purchase HoA for you in Act 2. Actually, you're gonna have to ask homies for a lot of gems we don't get access to as Marauder or wait till Act 3. Honestly lvling is not a big deal... just keep killing. 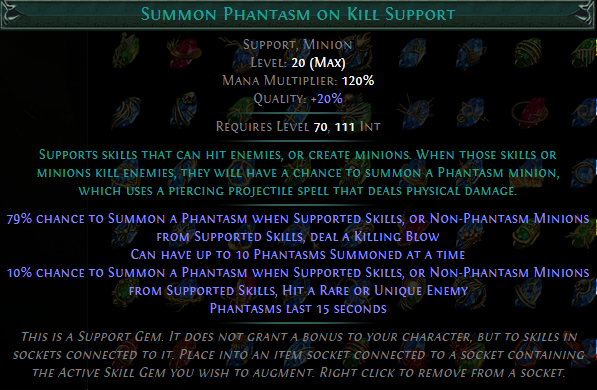 Really appreciate the help, will be rockin this for 3.6! I can't wait to lvl it up myself and see what new stuff to tweak it I can come up with! Also, my profile is public so you can always check my league toon to see what I'm doing. The nice thing about this combo is that currently I'm running pierce for fast clear, but if CWDT + Bane + PW is active enough, then cursed enemies will get pierced anyway. Freeing up the slot for the Phantasms. Can also just self-cast bane. Testing will tell if this is good or not. 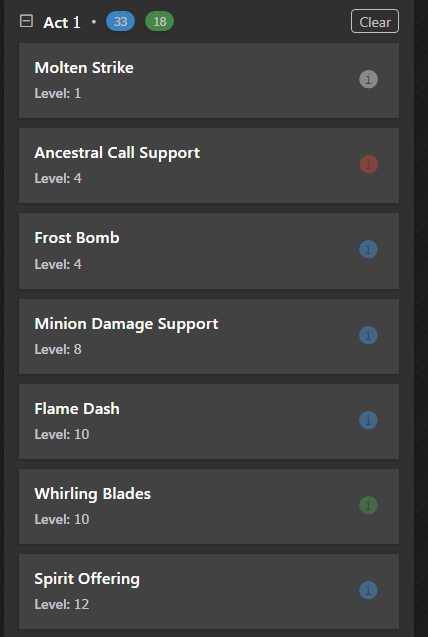 Also, the build has a lot of temporary effects on CWDT and free skill bar slots to self cast more things.